Rom has teamed up with Power Man and Iron Fist to defeat a Wraith menace in New York, one that also happens to involve the Fantastic Four. This is the second of a two-part crossover that continued from an issue of Power Man and Iron Fist, and it is an interesting team-up to say the least. 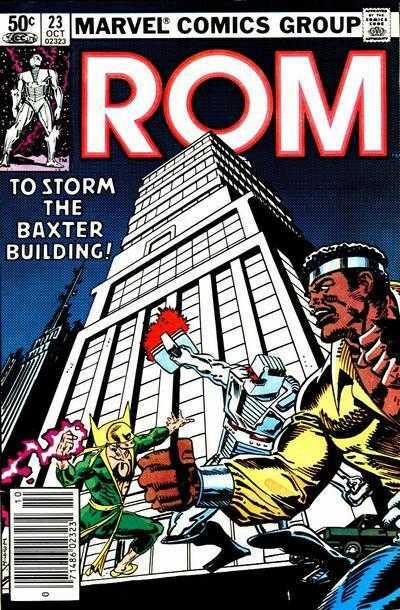 Bill Mantlo and Sal Buscema deliver some fast and furious action with the book and they make it quite exciting as Rom and the two heroes try and break into the Baxter Building. There are some really great action sequences within and Buscema is at the top of his game even after so many issues under his belt. There was a little scene in Clairton with Brandy pining for Rom, even while she was with Steve which in reality would seem a little awkward. Mantlo continues to deliver some solid dialogue and powerful stories and the most touching moment comes at the end of the issue when Rom is finally able to head off to Galador with the aid of the Fantastic Four. Rom needs to find out if his home planet still stands or is simply a wasteland and with Mantlo in charge, it is sure to be a powerful revelation. Another fun issue by the creative team in a line of fun issues, with what looks to be some interesting times ahead.